Dorothy, Scarecrow, Tin Man, Cowardly Lion, and Toto too. 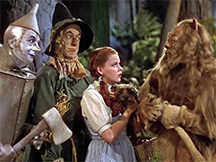 Photo from the 1939 film The Wizard of Oz. Warren fumed, "Now hold it. I might be getting on, but I'm not losing my mind. Last week you claimed you could have them both by October," he said, referring to the emergency meeting where they'd agreed on the plan for Marigold. Suddenly, Rita understood. "Ah," she began, "You asked, 'if we extend till October, could we finish the A list?' and I said yes. Then later you asked, 'If we extend till October, could we get the XP revisions?' And I said yes. But I thought you wanted budget and schedule for both scenarios separately, not both together. Now I understand." Warren held his ground. "That's right, and that's what you're going to do, because that's what you agreed to." Rita has just been reminded of how dangerous it can be to answer hypothetical questions in conversation. In the project context, perhaps the most common form is "If <some set of conditions>, can you achieve <some set of goals>?" There are other forms too, but we'll deal with this one. Answering these hypotheticals in conversation is often dangerous. Although it's probably safe enough to respond to hypotheticals in writing, conversational responses often lead to the Hypothetical Trap. In meetings or other conversation, the only safe answers are either "No, I don't think so," or "Hmm, I'll get back to you." Here are some reasons why answering more concretely is risky. is often dangerousthe hypothetical conditions don't exist now, and they might be outside your experience. Answering a question outside your experience is always tricky. Even a carefully framed question is just a sketch — it doesn't completely describe a real situation. Your answer is necessarily based on some assumptions, which might differ from the questioner's assumptions. People remember your answers much better than they remember the question's contingencies or any conditions you placed on your answers. For instance, if you answer "Yes" to "If we gave you a million two and another seven months, could you do it?" people remember the "Yes" better than they remember the "million two" or the "seven months." If you're asked two hypotheticals with two sets of assumptions, and you give two answers, people might remember your answers as if they were the answers to a single question, even if the contingencies are incompatible. This is what happened to Rita. If you said that you could do A for $A in M months, and B for $B in M months, you might be required to achieve both A and B for $A + $B (or less!) in M months, even though the world doesn't work that way. Would you like to see your comments posted here? rbrenLOZmvYEdAUAbklNJner@ChackXfkFoMqWvZTMZspoCanyon.comSend me your comments by email, or by Web form. I offer email and telephone coaching at both corporate and individual rates. Contact Rick for details at rbrenQKbTMOCdfEkJakDVner@ChaccXnmHPhDYmPAWCPaoCanyon.com or (650) 787-6475, or toll-free in the continental US at (866) 378-5470.